16 October 2013, 11:11 a.m.
Related to this I just finished a module on Udacity – the free online university – about How to build a startup run by Berkeley Professor Steve Blank (see his website). There is an essential difference between large corporations and startups. According to Blank: “Startups are not just small versions of large corporations.” Startups’ main role is to search (the customer, the right offering, the right business model etc). Corporations execute. That also means that entrepreneurs need a different skillset. Blank talks about the Business Model Canvas developed by Alex Osterwalder. I found that quite interesting and helpful. The Business Model Canvas subsumes nine essential elements you should consider in your venture creation. It will help to organise thinking, develop hypotheses and get out of the building to collect facts to verify/falsify these hypotheses. Using various Business Model Canvases over time can develop into a scorecard about what the entrepreneur has learned. Blank also states that business plans over five years simply do not work. A business plan often (or mostly) is proven wrong as soon as it hits the first customer contact. Blank gives a nice illustrative Soviet Union/communism analogy regarding long term planning. He also talks about the traditional split into product management and engineering, which in large corporations is usually done in a waterfall model way (i.e., isolated steps and units, executing one task after the other). The main problem with waterfall-based engineering is that you assume to know exactly what the customer problem is right at the beginning of product development when you start defining requirements and design. That means that you assume to know all the features you want to implement into a product a priori, which especially in a startup environment – but also in new product development in established firms – is rarely (or never) the case. In terms of startup organisation Blanks claims that at least initially there is no need for sales, marketing, biz dev departments or teams. Instead building integrated customer development teams (usually the founders) are recommended. Founders need to spend at least 20% of their time “outside of the building”, interacting with and learning to understand potential customers. Related to this, Blank mentions that “more startups fail from a lack of customers than from a failure of product development” which in fact stems from the prioritised product/technology-orientation of startups rather than customer-orientation. He also introduced the customer development approach, which essentially is about the search for the right business model. That is the search for the startup’s truth as basis of its existence. This comprises customer discovery, validation, creation, and finally company building. 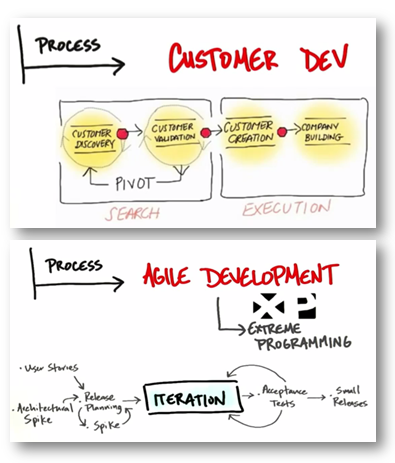 The figure below is taken from his video and shows the two aspects of agile customer development and agile product development. 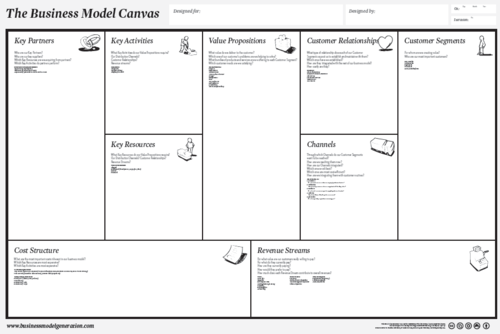 Find more information on the Business Model Canvas website, where you can download a pdf of the canvas and find a video describing how to best use it. This post was originally published on manfredbo.tumblr.com and is re-published here with minor modifications.